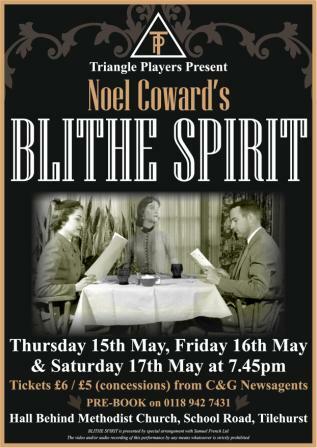 Blithe Spirit, a comic play by Noël Coward, was first seen in the West End in 1941, was adapted for a film in 1945, for a musical, High Spirits in 1964, adapted for television in the ‘50s and ‘60s and for radio and is still enjoyed by countless audiences today. 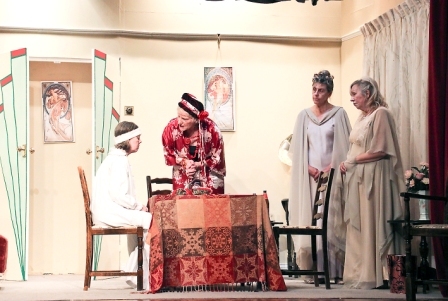 You have the chance to enjoy it in Tilehurst this weekend. 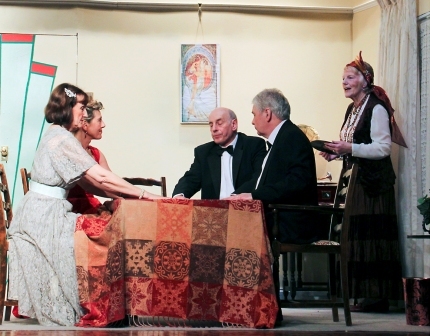 The play concerns the socialite and novelist Charles Condomine, who invites the eccentric medium and clairvoyant, Madame Arcati, to his house to conduct a séance, hoping to gather material for his next book but the scheme backfires. 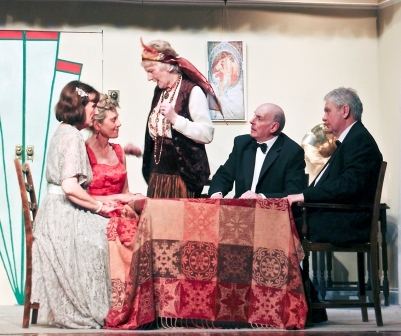 The Triangle Players may perform in a church hall as they do not have their own premises but they always set a very high a standard for their productions. 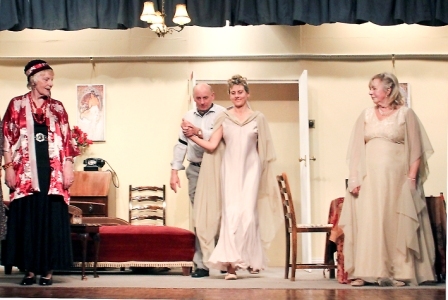 The choice of actors for the roles, the plush stage set and the attention to detail in the costumes and props for this production are all a true credit to the Producer and Director Tracy Harrison and her team. 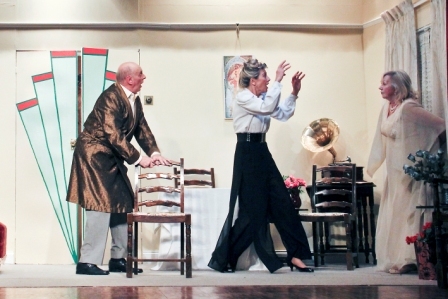 Although Charles Condomine and his second wife are the main characters in the play it is Madame Arcati that most people recall first in Blithe Spirit. 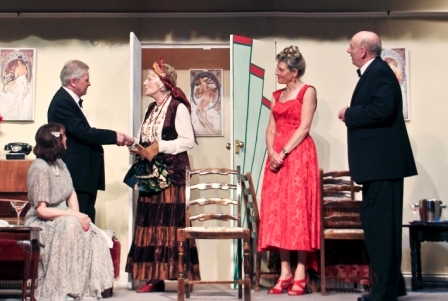 In this production she is played admirably by Valerie Hodgson who firmly sets a picture of her character as a dotty and eccentric woman from her first entrance. 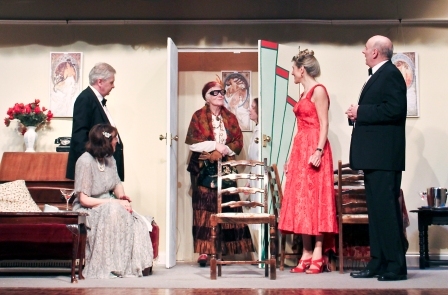 Her portrayal of Madame Arcati as vaguely manic and blissfully unaware of the scepticism of her hosts is a delight to watch. 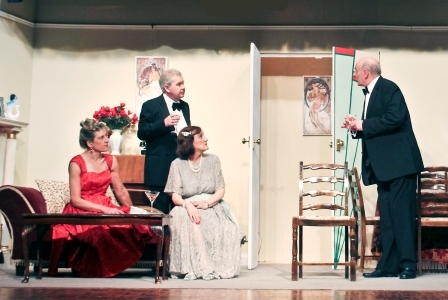 Ken Brownfield gives a masterly performance as Charles Condomine. He reveals him as a dominant but intrinsically weak man who thinks nothing of taking advantage of the well meaning but naïve Madame Arcati for his own interests. 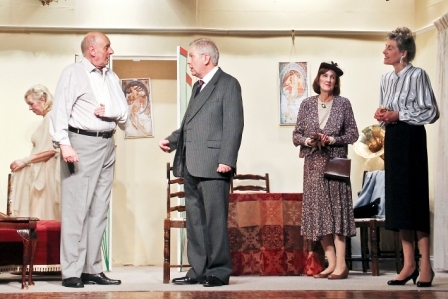 The subsequent events take Charles through a series of emotions and confusions and Ken is indeed equal to the challenge. 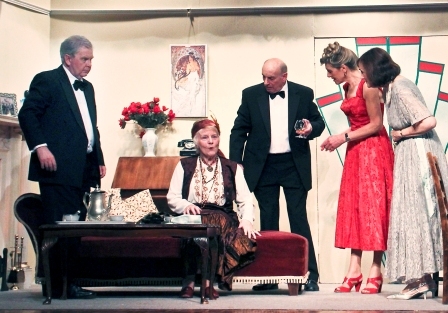 Christine Mather, as Mrs Condomine, confidently and elegantly portrays the second wife in a series of glamorous and striking outfits. 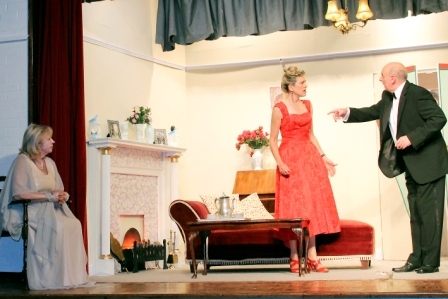 She dominates the stage, and her husband, and yet still manages to reveal to the audience an underlying uncertainty and need for reassurance in her marriage. 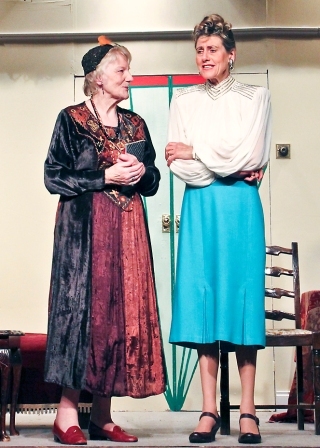 Jan Charlton, who plays Charles first wife Elvira, successfully provides a contrast to the assertive Ruth. She floats around the stage, mischievous and amused by her rival’s discomfort and seems to be enjoying the situation. 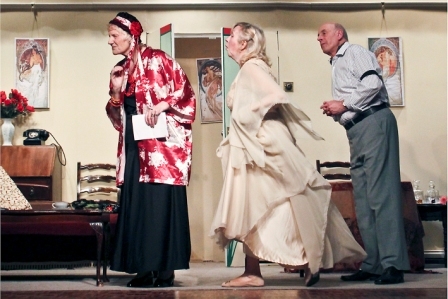 Jan uses her talent for comedy to good effect but there may be more to the character she first presents. 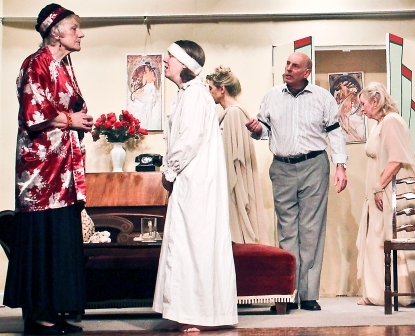 The actors playing the supporting roles are also worthy of praise. 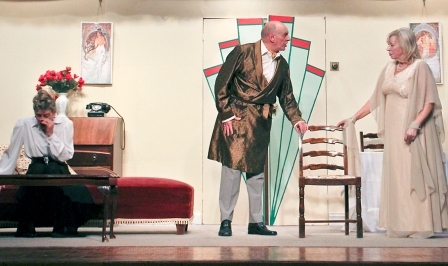 Bruce Thomas (Doctor Bradman) has been with the Triangle Players for many years and has successfully made the professional man (doctor, lawyer, etc) his forte and succeeds again. 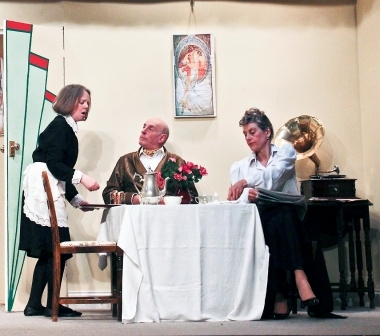 Pat Kelly is a new member whose talents were spotted when she joined the group for this year’s pantomime and her portrayal of the Doctor’s wife promises more roles for her in the future. 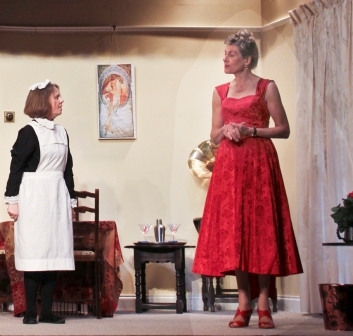 Edith the maid was played by Tracy Harrison whose repeated “Yes M’m”, is delivered with humour and deference. 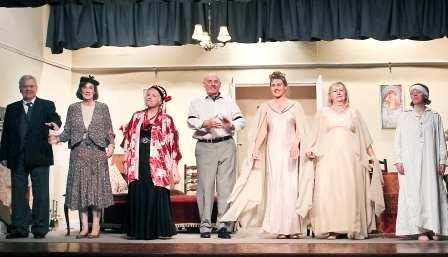 Her acting role is but a small part of a very successful play.